Yesterday, we said goodbye to an icon. Howie, who had just turned seventeen, was compassionately euthanized while surrounded by people who loved him. 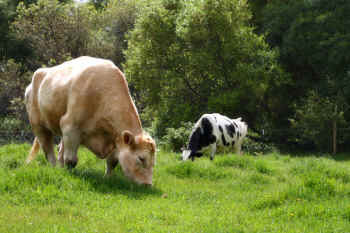 He was laid to rest next to Sadie, one of his closest cow friends. Howie has been the face of Animal Place for seventeen years. He has been a crowd favorite on tours and at events, adoring the attention from his fans. He has always been front and center whenever a news agency would arrive to do a story. And even in his old age, he never stopped being his delightfully stubborn self. Few cows know the love Howie has known. Few are ever fortunate enough to live out their lives in peace and to die with dignity and respect. We hope you choose to honor Howie in some way. Buy an apple - that was his favorite. Make a plant-based recipe for your loved ones. Go vegan. Donate to your favorite sanctuary or volunteer your time. What was supposed to be a celebration of Howie's arrival to Animal Place 17 years ago has turned into honoring Howie's life, legacy, and passing. The iconic Howie, beloved by thousands, has passed away at the noble age of seventeen. 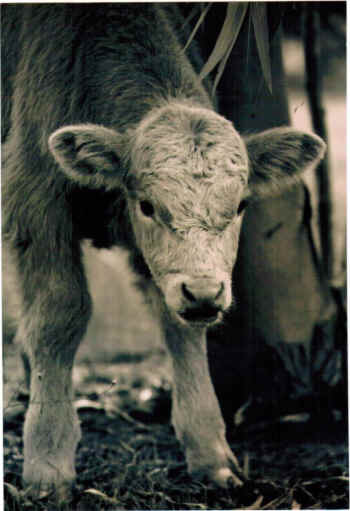 Seventeen years ago, a cow died giving birth to a cream-colored calf. 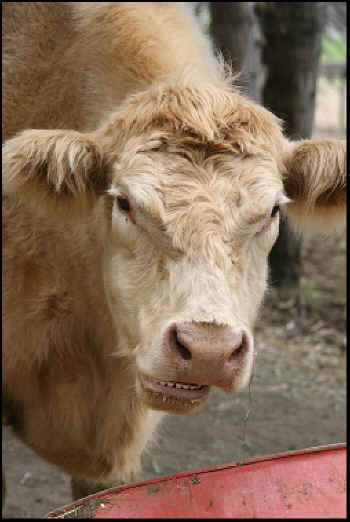 Unwilling to care for the calf, the farmer abandoned him outside of a Sacramento animal shelter. After spending the night in a metal box, a shelter employee opened the cage and saw the little calf. He exclaimed, “How did he get there?” From then on, he has always been referred to as Howie Cow. The local Sacramento new media learned of the little orphaned calf and Howie became an overnight star. This resulted in a deluge of supporters, friends, and family urging me to rescue Howie. But the shelter had other ideas for Howie. They wanted to raffle young Howie off to the highest bidder. The local Future Farmers of America (FFA) high school kids bought raffle tickets. 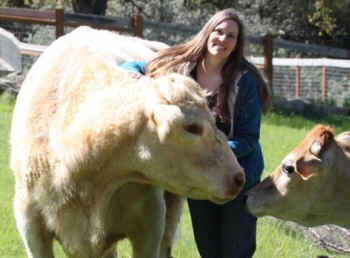 They wanted to raise Howie as a fair project – caring for him, then selling him for slaughter. I called the shelter and told them we would give Howie a lifelong home at our sanctuary. They turned me down explaining the raffle was in full swing and if we wanted to rescue Howie, we needed to buy raffle tickets in hopes of winning him. Not taking no for an answer, I escalated our “request” for Howie, threatening to invite the news media out to the shelter and let the public decide Howie’s fate. After a few days of negotiation, I drove to the shelter two days after Valentine’s Day to bring Howie home. The news media followed us all the way, documenting Howie’s new life. And the rest, as they say, is history! When I first started volunteering at Animal Place, Howie was 8-yrs-old and, as I would soon discover, still a playful calf at heart. I was out picking up poop in the animal yard, minding my own business, when I happened to look up at the hillside. I spotted Howie. He spotted me. And he just watched. Nervous, I kept scooping poop and loading it into the wheelbarrow for a trip to the compost pile. When the wheelbarrow was completely full, Howie made his move. Galloping down the hillside, through the open gate, he ran excitedly up to me and the wheelbarrow. Daring me to intervene, he circled around, kicking up his heels playfully. I stepped back from the wheelbarrow and Howie proceeded to lift it up and flip it in the air. All that hard work! But Howie seemed very pleased with himself! 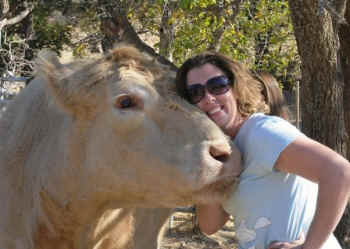 After dreaming about meeting him for a long time, he gave me dozens of bovine kisses. And a hug. It was love at first sight. When I realized I was going to be able to love Howie in his golden years when I joined Animal Place last year, I felt such privilege for the experience to shower him with love any day any place any time. Like so many other human friends, Howie has left a huge hoof print on my soul. I am forever changed by his love. One of my favorite memories of Howie was when it was just me and him alone in the pasture and he laid his head down on my chest. I literally could feel love passing between us. The connection at that moment between human and animal was greater than any words could express. Do you have a Howie story to share? Leave a comment, we'd love to hear from you. Moved by Howie's story and the love people had for him? Make kinder choices in Howie's honor, like adopting a vegan lifestyle.